Permanent F2P is here and just in time for the second birthday of Old School RuneScape! Permanent F2P is now here for Old School. Anyone and everyone can log on and play the F2P area of the game until their heart's content. 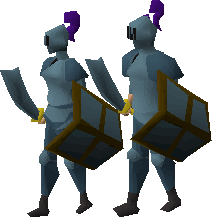 Both new and existing accounts have access to F2P Old School so whether you are a new or old player you can hop on and play for free! We're making some small changes to the F2P portion of the game to accompany the release of permanent F2P. Some time ago we removed the ability for F2P players to chop yew trees or fish lobsters. As we are introducing some additional limitations to F2P players, which will be detailed slightly further down in the news post, we have now made it possible for F2P players to chop yew trees and fish lobsters. In addition to this, the dark crab fishing spots found in the wilderness will now act as tuna/lobster/swordfish fishing spots when logged into a F2P world. In order to help deal with the expected influx of players, we have increased the number of low level monsters that spawn in and around Lumbridge. We have also added some additional areas to kill chickens, cows, goblins and frogs. We hope that this will make it simpler for new players to find places to get training and to do so without overcrowding. Skippy, the NPC that allows you to skip Tutorial Island, has now returned. This is to help deal with the large number of players that may end up on Tutorial Island and reduce any overcrowding. Skippy will be removed from Tutorial Island at some point in the near future once Tutorial Island is slightly less active. For the first 24 hours of in-game time on a newly made F2P account players cannot trade items off their account. They can still receive items but they cannot trade their items away. In addition to trading being restricted we have also restricted other ways of transferring items to prevent players circumventing the limits. • If you drop an item manually, the item is visible only to you. It does not ever become visible to other players. • If you die to a PKer, they will receive loot, however any stacks of items that you held when you died will be reduced to 1. For example, if you die with 1,000 coins the PKer that killed you will only receive 1. • You cannot add items to a Trade offer or Duel offer. When the trade screen opens a message on the screen will tell you how long it will be until you can offer items. We will be carefully monitoring the impact and effectiveness of these limitations over the release of F2P and will relax them if we find that we can keep on top of the bots, after the initial launch rush. If your account ever becomes a member after this update, these restrictions will stop applying to you, and will not come back if you unsubscribe in future. To help aid the community in F2P based events and helping give new players a great start to the game, we've given access to a spawner tool to some members of the community. Clan leaders, livestreamers and players focusing on hosting F2P events will be able to use this tool to spawn a limited number of starter kits each day for new or returning players during events. It's back and it's bigger than ever before: it's GameBlast15! Just like last year we'll be streaming for a full non-stop 24 hours on the SpecialEffect Twitch channel, starting at 12:00 noon UTC (game time) on Friday the 20th of February, right the way through to 12 noon the following day. This year we're taking it to the next level with explosive events and activities - including two fully fledged challenge teams who'll be going head-to-head with each other throughout the full 24 hours. We'll also be hosting some pretty hot live entertainment, including a live fire walk outside of the Jagex offices. Of course, we'll also be featuring your favourite JMods on our live stream and showcasing some awesome game content. We'll be reopening the Well of Goodwill, too: an in-game feature which allows you to donate in-game wealth to raise money for SpecialEffect, with every 1 million coins you donate converted into US$1. All money raised through the well will be sent on directly to charity. GameBlast is a community event, so we've invited over 30 players to join us at Jagex HQ this year, featuring on the live stream and adding to the great line up we've got planned. Last year we raised almost £50,000 for SpecialEffect and this year we're hoping to raise even more. With your help we know it's possible and above is just a teaser of what we've got planned for the night, so stock up on your energy drinks, get your snacks on standby and prepare for an action-packed night of fun, laughs, gasps and mad XP gains. We are celebrating the 2nd birthday of Old School this week and what a fantastic couple of years it has been. 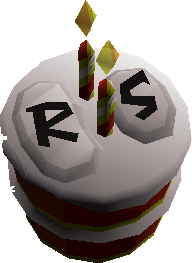 Head over to Varrock centre to grab yourself a slice, pick up the brand new cow outfit, finally get your hands on a war ship and celebrate! You'll find an enormous cake there for all Old School players to share as well as a couple of stalls where you can pick up your gifts from us. With the Grand Exchange, Achievement Diaries and lots more to come we are excited to get started with our 3rd year. Thank you all for your continued support and for helping make Old School the game it is today. • Fixed the grammar on the examine info of the light infinity colour kit. • Fixed the spacing on a sign post in Mort'ton. • Fixed the spelling of a message given while chopping ents. • Adjusted some item packs' availability on F2P worlds to be consistent with the items within them. Join us later today for the Old School developer Q&A on the the RuneScape Twitch chanel. We'll be answering the most pressing questions from the Old School community live at 5pm GMT. Immediately following the developer Q&A we will be hosting a F2P kick-off livestream where we run through Tutorial Island with the masses of players and get stuck into some low level Old School content. Be sure to join us! - "This is the nicest clan chat I've been in so far!" Join the #1 OSRS Slay Clan! Awesome update! Have fun everyone! Any new Danish players join "spillekrogen"